Aikido is a Japanese martial art which originated around the tenth century. It was developed into modern Aikido in the late 19th century by Morihei Ueshiba ( 1883 – 1969 ) as an unarmed defence against armed or unarmed attacks. It has continued to evolve and in it’s present form is a very effective self-defence art for men or women, regardless of size or strength. Aikido derives it’s effectiveness from the principles of non-resistance. Rather than struggle with an attacker, a person trained in Aikido learns to blend with the strength and momentum of the attack enabling the defender to throw or immobilise the assailant by joint manipulation. The Tomiki system was developed by Professor Kenji Tomiki ( 1900 – 1970 ), one of the top students of the founder of modern Aikido, Morihei Uyeshiba. Professor Tomiki was the first student to attain the rank of 8th dan under Morihei Uyeshiba. Professor Tomiki also attained the rank of 8th dan in Judo as a student of the founder of Judo, Jigaro Kano. From the influence of these two great masters and from his study of other martial arts, Professor Tomiki developed his own system of Aikido. Tomiki Sensei performing Shiho Nage. The Aikido Development Society was formed approximately twenty years ago and follows the teachings of Sensei Tomiki. Sensei Tomiki being one of the first students of O-Sensei Ueshiba, was also in his own right, a high ranking Judoka and very competitively motivated. The first Sensei to bring Tomiki Aikido into Great Britain was Senta Yamada. His teachings were more of an enjoyment form than competition. The society was created by a group of Tomiki aikidoka lead by Don Bishop (7th Dan) and Ahmad Saeed (7th Dan), Whose sole aim was create a friendly atmosphere in which Aikido could be taught, practised and developed to ensure the continuation of this marvellous martial art in Britain. All of the senior members were introduced to this sport by high ranking Japanese instructors and continue to practise aikido today. Aikido in the U. K. traces its roots back to 1955 when Kenshiro Abbe, who established the British Judo Council in London, began to give instruction in aikido. Abbe had come to the U. K. through the intervention of the London Judo Society. Among his first students was Ken Williams, one of the pioneers of aikido in this country. Abbe visited the Aikikai of London operated by Williams of the British Aikido Cultural Council in 1956. This first aikido dojo was under the auspices of the British Budo Council. In 1958, Abbe established the International Budo Council and about this time brought Tadashi Abe from France to demonstrate and instruct aikido. Also in the late 1950s, TOMIKI AIKIDO began to be practiced in the U. K. due to the efforts of Senta Yamada, a 6th dan in both aikido and judo, who taught for the British Judo Association. Yamada, who had studied under Morihei Ueshiba and Kenji Tomiki, encouraged his top judo players who were approaching the end of the competitive careers to try the then little known aikido. A number of independent clubs led by Yamada’s judo students began to spring up. Ken Williams was awarded a 1st dan by Abbe in 1959, and a 2nd dan the next year at the same time Haydn Foster, another early figure, received his 1st dan. Williams and Foster became National and Assistant National Coaches, respectively, in 1961. Another Japanese instructor residing in France, Masamichi Noro, began a regular series of visits to ‘The Hut’,† as the Aikikai of London had come to be called, in 1962. The dan grades and coach positions of Williams and Foster were later ratified in 1963 by Mutsuharu Nakazono, representing the AIKIKAI HOMBU in Europe. Kenshiro Abbe returned to Japan for the Tokyo Olympics in 1964 after completing a one-week judo course during which aikido was taught by Nakazono. On the Tomiki Aikido side, Senta Yamada returned to Japan in 1965 leaving some ten clubs run by his students. These groups had infrequent contact and no common training or grading program. Among the dan grades promoted by Yamada were John Wilkinson, John WAITE, Ah Loi LEE and Bill Lawrence. Yamada’s vacancy was filled by Riki Kogure, a businessman and student of Tomiki at Waseda University who was transfered to the U. K. in 1966. From Japan shortly thereafter, Yamada urged the formation of an organization to group together the various Tomiki Aikido clubs. The result was the foundation in 1966 of the BRITISH AIKIDO ASSOCIATION (BAA). Among the leaders of the newly formed organization were Jim ELKIN, who shouldered various administrative responsibilities, and John Waite. 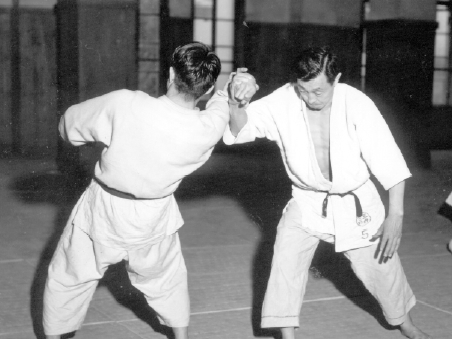 Kogure, a skilled technician, taught a high level of Tomiki Aikido techniques. Elsewhere, after a recommendation by Nakazono that members of the British Aikido Cultural Council become independent, a new organization called the RENOWN AIKIDO SOCIETY headquartered at the Aikikai of London was founded in 1966. The Society already had a number of affiliated clubs in various parts of the country. January of 1966 saw the arrival of Kazuo CHIBA to the U. K. as the official representative of the Aikikai Hombu. He received final approval from the Aikikai Hombu to establish the AIKIKAI OF GREAT BRITAIN in October. Chiba visited the Aikikai of London in 1967 for a seminar and became increasingly active as the director of the newly-formed Aikikai organization. Chiba spent ten years in the U. K. and was a highly influential figure. In 1970, he introduced a FUKU SHIDON system whereby senior students were taught a basic teaching system for dissemination to their students in an effort to achieve uniformity of instruction. He also introduced the practice of the AIKI KEN and AIKI JO on a regular basis in his courses. By 1974, aiki weapons became part of the grading syllabus for higher grades. Chiba, moreover, invited many Aikikai Shihan to teach in the U. K. during his stay. DOSHU Kisshomaru Ueshiba paid a visit in 1975. In 1968 two young Tomiki Aikidoka arrived in the U. K. and assisted Kogure in providing instruction. They were Tsunemitsu Naito, a 4th dan Tomiki competitor from Waseda University, and Takeshi INOUE, a 5th dan. Naito stayed for less than a year, but taught the junanahon kata (basic 17 movements) for the first time. Inoue introduced various koryu kata and remained until 1972. The first Tomiki Aikido Championships were held in 1969 with Kogure, Naito, and Inoue as referees. Kogure also awarded a number of dan and kyu rankings. He was the major figure on the Tomiki scene in the U. K. until his return to Japan in 1969. In addition to those already mentioned, the following Japanese instructors visited and taught in the U. K. during the 1960s period: Katsuaki Asai, Toshikazu Ichimura, Hiroshi TADA and Nobuyoshi Tamura. Foster was approached in 1973 by ex-instructors of the Renown Aikido Society with the proposal that a new organization be formed. The new group was dubbed the Institute of Aikido, which allowed member dojos to retain their autonomy while forming a functional political unity. In September 1974, Foster and David Timms entered into negotiations with the British Sports Council and British Karate Control Commission to urge the creation of a martial arts control body to prevent the proliferation of undesirable elements. This tentative effort also had the support of Jim Elkin of the BAA. The result was the creation in January 1977 of the Martial Arts Commission (MAC) which together with the Sports Council advised county councils within the U. K. who were bona fide martial arts practitioners and therefore in possession of adequate insurance for use of county council premises. Shortly after the creation of the MAC, the BAA approved the entry of the Kai Shin Kai group, headed by Mike Smith, to its ranks. What was unique was that Smith’s group, which practiced Aikikai Hombu-style Aikido, was admitted into an organization of Tomiki Aikido practitioners. A Kai Shin Kai Division of the BAA was formed to accommodate Aikikai-style dojos. This resulted in a certain amount of interaction and exchange among the two forms of aikido within the BAA. Kazuo Chiba left the U. K. to return to Japan in 1976 leaving Minoru Kanetsuka, a 4th dan at that time, as his successor. A name change soon followed and the Aikikai of Great Britain became the BRITISH AIKIDO FEDERATION. Kanetsuka’s BAF was the sole organization recognized by the Aikikai in Tokyo for some ten years. Following talks initiated by Foster and Timms two years earlier with Elkin of the BAA, the Aikido Liaison Board came into existence early in 1977 in an effort to create an umbrella aikido federation for all styles. This body was renamed the BRITISH AIKIDO BOARD on 2 June 1977. The founding members and their directors were: the Aikido Development Society (A. Saeed), British Aikido Association (J. Elkin), British Aikido Federation (M. Kanetsuka), British Yoshinkan Aikido Federation (J. E. Yu), Institute of Aikido (H. W. Foster), Ki Federation of Great Britain (K. Williams), Shudokan Institute of Aikido (E. Stratton), and the United Kingdom Aikido Federation (J. Cornish). On 8 April 1978 the British Aikido Federation withdrew from the BAB due to political differences and was followed soon after by the Ki Federation of Great Britain.